Ben Masel, prominent marijuana activist and professional rabble rouser, died Saturday from complications due to lung cancer. He was 56. Diagnosed in January, Masel had recently made it through 25 radiation treatments for the disease, but was too weak to face chemotherapy. He died just before 9 a.m., surrounded by family at a nearby hospice center. "He made a point of living at the front lines and fighting for his rights," said Semilla Anderson, Masel's daughter. "He will be remembered for that." Masel was born in the Bronx and grew up in New Jersey. He moved to Madison in 1971 and quickly became a fixture of the counter-culture, known specifically for acts of civil disobedience in the cause of legalizing pot. For the past 10 years he served as the vice president of the state chapter of the National Organization for the Reform of Marijuana Laws. Masel was the state director for six years in the late 1980s and early 1990s. And in truth, when news broke last month that Masel had lung cancer, there were many who thought it made sense. After all, he spent a lifetime smoking cigarettes and was, by his own admission, a "heavy" marijuana smoker. But friends and family hope that people will remember that Masel stood for a lot more than just one controversial cause. "He wasn't just some pothead," said Sal Serio, a longtime friend. "He respected the constitution. He respected the system. And he fought to make sure others did too." In fact, Masel made his living fighting those who tried to limit personal freedoms and rights. He was, for lack of a better term, a professional activist. Jeff Scott Olson, Masel's attorney for the past 20 years, said his client focused mainly on challenging limitations to free speech and right to assemble. Whenever police departments or cities tried to stop him from collecting signatures or protesting, he would sue. And according to Olson, he almost always won. Said Amy Gros-Louis, a friend of 25 years, "Ben knew the laws better than the police did." Masel often joked that his method of making a living offered a "great hourly rate if you can wait forever to get paid." Masel joked a lot; it's one of the things people say about him most. He was a perennial candidate for elected office. He ran for Dane County Sheriff once; governor and senator too. And he was a protester to the end. Even in his weakened state, Masel managed to show up at the Capitol during the month-long protest in March. But behind all of that was a funny and decent man. He may have looked like a graying lion, but friends said he was a gentleman. "He was always courteous and reasonable," Olson said. "And that was because he was always ready to give someone the chance to change his mind." Said Serio, "He was a special person. He will be missed." I was privilaged to have known him via attending NORML conferences since the late 1980s. I was always amazed at the propensity of people as intelligent as Ben, taking up the Tobacco-cigarette habit, despite all that has been known and revealed about the dangers. one getting a head start internationally due to it being less volatile then the other leaf, and thereby being easier adaptable to remaining sufficently fresh on the long ocean voyages back to the 'Old World'. Tobacco becomes a major international commodity by the 1600s, whereas Coca does not begin to so make it big until the 1860s with its formulation and marketing as Vin Mariani, initially sold as an energizer for overworked, overstressed Parisian opera performers, and inspiring other such Coca leaf derived herbal products as other Coca beverages, lozenges, found to have numerious therapeutic virtues- including as a substitute for other substances with similar uses, particularly Tobacco. And writing, in an article by a Dr. F.E. Stewart appearing in the September 19, 1885 Philadelphia Medical Times, about a newer form of Coca leaf products intriduced by the 1880s- Coca leaf smokables- cigars, cheroots and even cigarettes. Information on Coca leaf smokables, their history and decline is rare- for records showing sales or later accounts are generally inaccessible. As these even included a pipe mixture, described in its day with the misnomer as a "smoking Tobacco", Coca leaf smoking presented some interesting parallels, for one the possibility they were a more benign substitute to smoke then Tobacco. Among “chewers” of these respective agricultural commodities, oral cancer is common with those using Tobacco, yet its rare among chewers of Coca. Among "smokers" of these plant substances, Virginia Bright Leaf Tobacco is long associated with lung cancer- far longer then commonly thought, significently pre-dating the official U.S. government acknowledgment of 1964- for instance, Harvey Wiley warned about it in Good Housekeeping reportedly as early as 1916, and with the correlation even noted on the floor of the U.S. Senate during the 1914 debates upon the Harison 'Narcotic' Tax Act signed by U.S. President Woodrow Wilson, December 17, of that year. 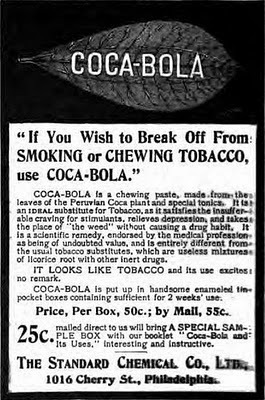 The Coca leaf smokables were introduced only about 30 years before this 1914 ban, hence having less of a history to be fully aware of their long term chronic effects, though no recognized such corelation. Research upon this appears non-existent- baring any possible secret research, much like the cigarette companies' purported non-study of the pharmacological properties of nicotine. In any event, either smoked, or drank as a beverage or some other oral means, Coca's effectiveness as a Tobacco substitute was recognized, as evidenced by the positive accounts as the preceeding, and the type of 'misunderstanding' that began being peddled by the latter 1880s. Thoughtful Citizen: The drug stores and the soda founts are selling enormous quantities of something they call coca cola. It is said to relieve nervousness, and "that tired feeling" and all that sort of thing, and people are drinking it a dozen times a day. I am told by a physician that the ingredient which makes coca cola so popular is cocaine. There is evidently enough of it in the drink to affect and it is insidiously but surely getting thousands of people into the cocaine habit, which is ten times worse than alcoholism and is bad as the morphine habit. It is an awful drug and the victims of it are slaves. I have seen it!" And here the gentleman shuddered. Thoughtful Citizen: "A friend of mine was a victim of it," he continued, "and he killed himself before my eyes. He got so under the power of the cocaine habit that he saw he could not stop it, and he took a pistol and ended his life. "I am confident that a chemical analysis of coca cola would show the presence of cocaine. A physician tells me that is the ingredient which makes it popular, and it seems to me that it is a matter which the board of health ought to look into." I [sic] know, therefore, whereof I speak, when I point out the awful danger threatened by the popular sale and use of such drinks as are founded upon the support of the coca leaf and the kola nut, and the catarrh snuff containing pure cocaine. Cocaine is not a safe drug for self-administration, in any way [emphasis added], and what then can be said of its use in ignorance, under a delusion that it is a tonic to nerve and stomach, and heart, administered at soda fountains, and out in chewing gum, to give strength to some organ. If one may believe but a tithe of the reports which have lately been made from various quarters, the cocaine habit is spreading to an alarming extent. This habit is one so disastrous in its results as to excite the gravest concern of all those who have had the least sense of sympathy with their fellowmen; those upon whom it becomes flexed sink to depths of physical and mental degradation not sounded by even the devotees of opium. Physicians are doubtless responsible for some of the spread of this frightful evil; in treating disturbances of the nasal passages they have used this agent as a palliative, often placing it in the hands of the patient to be employed at pleasure. As it cannot be expected to have any real curative action, its frequent application as a measure of temporary relief may be expected to follow, and its constitutional effect will soon become pronounced. But the chief cause is presumably to be found in the placing of the drug before the nostrum-taking public in the guise of catarrh "cures" and the like. The use of such preparations is manifestly fraught with the gravest danger, as the self-prescriber has no warning as to the risk he is incurring The question of prohibiting the sale of the drug in any form, "patent" or otherwise, excepting under suitable stringent regulations, is attracting legislative attention in Illinois. A bill is to be, or possibly already is, introduced in the Legislature for this purpose, and the local government of Chicago has been considering the matter independently. All reputable druggists may be expected to cordially favor such a movement wherever it may take form. And now that the note of alarm has been so strongly sounded, they may be expected to exercise renewed care as to the chance of placing in the hands of a lay customer a drug which is none too safe even in the hands of the physicians. And this warning may be extended to the parent drug, the use of which, especially in wines, has become popular during late years, and is asserted to be on the increase. It must always be borne that the use of any drug of this nature is attended with the risk of the formation of a "habit," and the responsibility for the employment of such agents should rest with the physician and not the pharmacist [emphasis added]. Such reflected the fear of Coca in the portion of the U.S. where it was enjoying its greatest popularity growth- the southeastern U.S. where Tobacco is 'King'. Such a geographically based fear was evident through the post 1903 national campaign to ultimately supress Coca- an agricultural commodity that at that time was otherwise destined for even greater international commercae popularity, given the United State's takeover of the project to construct a Panama Canal, which once completed would have significently shortened the shipping of Coca from ports on South America's Pacific coast to northern Atlantic markets, and which was completed and opened to traffic in 1914, the year of the Harrison 'Narcotic' Act banning Coca. It was evident in the 1908 'Homes' Commission. During the past decade soda fountain specialties containing caffeine, extract of kola nut and extract of coca leaf, the active property of which is cocaine, have been offered in considerable quantities and, due to extensive and attractive advertising, both as beverages and as headache remedies and nerve tonics, their sale has assumed large proportions. The first appearance of preparations of this type was in the South in the eighties, their importation following the success which Moxie had attained in the East, though this particular drink was of an entirely different character. From the South the demand spread in other sections and the number of products has increased until the present time, there are probably over one hundred of them bottled and sold all over the United States. The USDA crusade against Coca or cocaine in any amount particularly ironic was the particular medicinal use of Coca the USDA was to reserve its fury for: Coca as a Tobacco substitute! All of them are ineffective, and some contain cocain in one form or another, which at once indicates the purpose of the promoter of the remedy. Instead of eradicating what is commonly believed to be a comparatively harmless habit, there is grave danger of fastening a pernicious drug habit upon the user. Examples of preparations of this character recently examined and found to contain cocain and caffein derivatives are Coca-Bola, Tobacco Bullets, and Wonder Workers. The Coca Bola is marketed by Dr. Charles L. Mitchell, of "Philadelphia, and the Tobacco Bullets by the Victor Remedy Company, now the Blackburn Remedy Company, of Dayton, Ohio, while the Wonder Workers were produced by George S. Beck, of Springfield, Ohio. E.F. Ladd, North Dakota Agriculture College, N.D. Your favor of September 7th duly received for which please accept my thanks. Owing to the “crank’ legislation of many states we have discontinued the manufacturer of all coca and cocaine preparations. Any “fool” druggist of your state who gets or sells an old package of our coca-bola does so at his own risk, as necessarily, having been put out some time ago, there is no guarantee, and we will not protect him. The people are getting a little sense into their heads, however, gradually, and they will sometime realize that preparations of both coca and cocain have an honest and legitimate use by the medical profession. Your state law is silly and on par with the 9-foot bed sheet laws of Texas and Oklahoma. Of course, your duty is to enforce the law, not to criticize it. I can do that. A letter of this kind needs no comment, and a product of this kind, in the judgment of the writer, can only be sent out for malicious purposes and its sale is illegal in North Dakota. We warn the public against either handling the same or using the same, if they would avoid the formation of a serious drug-habit and one that must result in positive injury to our people. This product, put in the form of a gum, would easily take the place – for one who had formed the habit for cocain – of tobacco; and it might be made to take the place of chewing gum with young people who would be entirely innocent of the intentional use of any such preparation, not knowing the evil effects that would come from its continued use. In the judgment of the writer, no man who will allow his name to be connected with a scheme of this kind should be permitted to disgrace the profession of medicine by using the title M.D. L.D. Ladd’s above closing words are perversely ironic given this ‘fear’ over Coca’s displacement of Tobacco, with its basis upon confusing the abuse of concentrated cocaine sniffing powders and injections with Coca leaf and extracts of comparable low potency and how this would completely disregard these two different plant commodities’ relative health effects. According to researcher Dale Gierlinger, the first U.S. State to ban MJ -- without a prescription -- was Massachusetts with its 1911 statutes' requirment of such for any of the substances listed in Harvey Wiley's 1906 U.S. 'Pure' Foods & Drugs Act's inconsistent labeling requirement list (of essentually habit-forming agents other then caffeine and nicotine). opium, morphine, heroin, codeine, cannabis indica, cannabis sativa, or any other hypnotic drug or any salt, compound or preparation of said substances is kept . Friday marks an unhappy anniversary in hemp history. On April 29, 1911, Massachusetts enacted the first state law making it illegal to sell or possess cannabis without a prescription, becoming the first U.S. state to institute marijuana prohibition. Violators of the new law were subject to a $100 fine and up to six months in jail, and just being present in the same room with marijuana could get you three months, according to cannabis historian Dale Gieringer of California NORML. Ironically, marijuana was merely collateral damage of the Massachusetts law, which was aimed primarily at other “hypnotic” drugs such as opium, morphine and heroin. Abuse of opiate painkillers had become a concern among reformers and temperance advocates in the early 20th century, and cannabis was added to the list “for the sake of completeness,” since it was also a hypnotic palliative commonly found in pharmacies. 'Collateral' insofar as being included in the list of substances in the 1911 Massachusetts statute. Section 1. If a person makes complaint under oath to a police, district or municipal court, or to a trial justice or justice of the peace authorized to issue warrants in criminal cases, that he has reason to believe that opium, morphine, heroin, codeine, cannabis indica, cannabis sativa or any other hypnotic drug or any salt, compound or preparation of said substances is kept . . . Section 2. Whoever is so present where any of the aforesaid drugs is found shall be punished by a fine of not more than fifty dollars or by imprisonment in the house of correction for three months. Section 3. Whoever, not being a manufacturer or jobber of drugs, wholesale druggist, registered pharmacist, registered physician, registered veterinarian, registered dentist, registered nurse or an employee of an incorporated hospital, or otherwise entitled by law to have possession of any of the above mentioned drugs, is found in possession thereof, except by reason of a physician's prescription, shall be punished by a fine of not more than one hundred dollars or by imprisonment for six months in the house of correction. the fluidextract of coca in a glass of sherry wine, taken immediately before the curtain rises, will do much to secure a satisfactory control of the voice during the performance. Symptoms.—The voice, as a rule, is chronically hoarse, but the degree of hoarseness varies materially from time to time. In singers the injury to the voice will be manifested in loss of range, diminished endurance, and loss of control. As the disease advances, all vocal efforts will be obviously strained and labored. Cough is by no means a constant symptom. The secretion is at no time very great in amount and diminishes as the disease advances. It is thick, starch-like, and tenacious. Small amounts of mucus frequently collect in the interarytenoid space and, being suddenly detached by coughing, are thrown out through the mouth to a considerable distance, while little bridges of mucus are sometimes seen with the laryngoscope extending from cord to cord. There is a constant feeling of constriction, as of a foreign body in the air-passages. Upon inspection certain portions of the mucous membrane of the larynx appear redder than normal; and sometimes the entire mucous membrane of the larynx is of a uniform red color, with the exception of the cords, which may be somewhat lighter in color than the surrounding parts. The mobility of the cords is frequently impaired, either from swelling of the mucous membrane covering the arytenoids or from slight muscular pain. Erosion of the interarytenoid space is frequently seen. I have been experimenting for some time with the leaf of Erythroxylon Coca in the form of a cigar—first, for the purpose of ascertaining whether the drug would thus produce its physiological effects, and, secondly, in view of a new therapeutic application. It is too soon yet to express a positive opinion in regard to the latter, but I have had sufficient experience with them to say something about the former; and as I find that others are already commencing to enter this field, I may be excused for calling the attention of the profession at this early date, my excuse being that I wish to receive what credit may accrue from my share in their introduction. Some time after I commenced my experiments I found that Dr. Lewis Lewis, of this city, was employing coca in the form of a cigarette, in the treatment of throat affections, with success, and, as he says that he has been using the drug in this way for nine years, he is entitled, certainly, to the credit of priority. Dr. Lewis's cigarettes are composed partly of coca- and partly of tobacco-leaf. This has its advantages and disadvantages. Without discussing this point, however, I employed a cigar made of pure coca-leaf, with a wrapper of mild imported tobacco of fine quality, and a cigarette of pure coca-leaf containing no tobacco, wrapped with the best quality of rice paper. Those who do not object to the tobacco can use the cigars, while those who have objections to it can employ the cigarette; while for those who object to the tobacco wrapper and the paper wrapper also, I prepare a " smoking tobacco " of pure cocaleaf, without admixture of any kind, which may be smoked in a pipe. Coca is too well known to the profession to make it necessary for anything more than the briefest description of the plant, its history, or its virtues. The Erythroxylon Coca grows in moist and woody regions on the eastern slope of the Andes, from two thousand to ten thousand feet above the level of the sea, and is highly valued and cultivated by the natives of Peru, Chili, and Bolivia, who make great use of it as a medicine and as an article of diet. It answers as a substitute for the tea, coffee, tobacco, hashish, opium, etc., of other nations. The natives masticate the dried leaves with finely powdered chalk, or with a highly alkaline substance prepared from roasted potatoes and the ashes of various plants, and which they call llipta. It is said that its use enables them to endure fatigue and exertion for many hours, and even for several days, with but little nourishment of any other kind, and while under its influence they are said to perform prodigies of labor. Let me compare, therefore, the action of these cigars with that said to be produced by the drug, not only by the natives, but by Bartholow, Wood, the United States Dispensatory, the National Dispensatory, and other authorities equally well known, who are investigating the properties of this remarkable drug. First, all authorities agree that the use of coca, either in the leaf, fluid extract, or wine, is followed by a feeling of contentment and of well-being; the sense of fatigue is removed: drowsiness is experienced for a brief period, but is soon followed by wakefulness and increased mental activity. The celebrated pedestrian Weston, having learned their powers, was detected in the use of coca-leaves during one of his extraordinary feats in London. The question, then, is, does coca, smoked, produce these effects? Personally, I have found the effect of smoking coca-leaves to bear out the statements that the drug produces a general excitation of the circulatory and nervous systems. Smoking and inhaling the smoke of one or two cigars will increase my own pulse-rate some eight or ten beats to the minute. It certainly relieves the sense of fatigue. Smoked at night, in my own case and in the cases of several of my patients, it produces wakefulness, similar to strong coffee. he uses a cigarette, and finds perfect relief. ~~He uses three per day, and also has used an application of two-per-cent. solution of muriate, but finds that the cigarettes relieve him quicker and the effects last longer." To sum up, therefore, coca smoked seems to produce the same effect on the system as coca taken internally in the form of fluid extract, wine, or elixir, but not in such a marked degree. Coca itself is known to be stimulant, tonic, and restorative to the system in the treatment of various diseases marked by debility and exhaustion. Nervous debility and exhaustion in all its forms, whether caused by diseases or excesses, are said to be relieved by it. Fatigue disappears, to be followed by a feeling of indescribable calm and satisfaction, increased strength of brain and muscle, and desire for mental and muscular occupation. Coca has been used with great success in the treatment of the opium habit. It is also an excellent substitute for tobacco. It has been successfully used in dyspepsia, flatulency, colic, gastralgia, enteralgia, hysteria, hypochondria, spinal irritation, idiopathic convulsions, nervous erethism, and in the debility following severe acute affections. As it is a valuable restorative agent, checking tissue-waste, it is a useful remedy in consumption and wasting diseases generally. It is also of value in the nervous forms of sick headache, viigraine. It is said to be an aphrodisiac. Cocaine, taken orally and dilutely in Coca beverages, as caffeine is taken by drinkers of Coffee and Tea, is not only absorbed slowly, avoiding the addictive spike of concentrated dosing, numbs the stomach, inhibiting the appetite for more. "The dangers of alcoholism would be avoided if no other stimulant were taken for mental or physical trials than that offered by the generous Vin Mariani. The full importance of this will be better appreciated when it is recalled that [Gustave] Mesureur is the Director of Hygiene and Public Health in Paris, France, and it was he who approved anl signed the radical governmental posters against alcoholism. That his favoring sentiment is accepted by those who have personally familiarized themselves with the merits of Vin Mariani is further shown by liberal commendations from many members of the most conservative of all medical societies—The Academy of Medicine o£ Paris. France—an opinion which is supplemented by a majority of professors of the Faculty of Medicine of France.—Coca Leaf, March, 1904. Coca, Cocaine.—After all that has been written on the subject during the last few years, not much new can be expected in the 12 months just past. It has been asserted that the value of coca wine or extracts does not depend on the alkaloid alone. Nachtigall,12 for instance, insists that coca wine and "coca tobac," must be made from the leaves and not from a cocaine solution. This is a question outside of our province to determine, and we shall discuss the drug and its alkaloid together. In diseases of the digestive tract, Eller57 recommends for toothache, absorbent cotton saturated with a solution of cocaine and morphia and allowed to dry. A pledget of this is to be introduced into the diseased tooth. Dailly50 also praises the action of cocaine hypodermically before the extraction of teeth, though severe constitutional symptoms may be produced in this way. Dujardin-BeaumetzTM recommends cocaine to facilitate lavage of the stomach. In gastric pain and vomiting it is also useful in tablespoonful doses of a solution of 1 part in 600, given every quarter of an hour until the patient is relieved. Frey*' has used | grain dissolved in water in a case of constant vomiting where other means had failed. Immediate relief followed for 2 hours; another dose stopped the vomiting for 6 hours, and after the third dose it entirely ceased. In gastric and intestinal catarrh, as a palliative in carcinoma ventriculi, and to dispel or prevent the sense of hunger, coca wine is highly recommended by Nachtigall.12 Perhaps the most important communication is that of Diederich's,58 who has employed the tincture (1 part of the leav es to 5 of alcohol) in 45 cases of diarrhoea in children, in doses 4—6 drops at 3 months of age, and up to 15-20 drops in older children every 2 hours. In all but 2 cases, the diarrhoea was promptly checked at latest after 48-70 hours. For the diseases of the respiratory apparatus, cocaine has been previously recommended in pertussis, and its use here is again upheld by our Corresponding Editor, Dr. Gougenheim,''3 who paints the walls of the nasal fossa with it in solution; and bv Diederichs,58 who used the tincture of the leaves (1 part to 5) internally, and sometimes a cocaine solution locally to the pharynx with most satisfactory results. The last-mentioned writer has also given coca in bronchitis and in spasm of the glottis. Nachtigall12 employs cigarettes made of coca leaves in the treatment of asthma, and considers them preferable to those made of hyoscyamus or stramonium. As a cardiac tonic the preparations of coca have frequently been recommended, and Lcyden has already declared the wine of coca to be a very useful agent in cardiac overstrain. Beverly Robinson4 has used it (Mariani's) on several occasions where digitalis proved useless or injurious, and considers it one of the best means to restore the heart muscle to its normal tone. Under genito-urinary diseases, Dujardin-Beaumetz'"" relates a case of incontinence of urine in a young man of 17, cured by injections into the bladder of 0.5 grams of cocaine in 100 ccm. of water. Very little absorption takes place from the vesical mucous membrane, but it is necessary to assure ourselves that no dissolution in the continuity of the lining of the bladder is present, otherwise dangerous symptoms might follow. For the treatment of burns, Eller67 has recommended to employ absorbent cotton saturated with cocaine and boric acid in glycerine. Wende13 uses it with lanoline as an ointment in burns and in itching cutaneous diseases. Finally, as a nervine, the coca tincture, and especially the coca cigarettes are recommended by Nachtigall12 in migraine; and Diederichs58 reports a few favorable results from the use of the tincture or extract of coca in epilepsy or chorea. The number is, however, too small to base any conclusions upon it. Relating to Sales of Narcotics and of Proprietary Medicines Containing Alcohol. On December 27 and 28, 1905, upon the invitation of the Legislative Committee of the American Pharmaceutical Association, a conference was held at the Hotel Stratford in Chicago to consider legislation to regulate the sale of narcotics and proprietary compounds containing alcohol. There were present at this conference delegations representing the American Pharmaceutical Association, the Proprietary Association of America, the National Wholesale Druggists' Association and the National Association of Retail Druggists. The delegates were not authorized to take final action as to any particular form of a law, but were merely appointed to confer together and refer back to the bodies which appointed them. There was considerable discussion and the following was regarded as a good working basis for a discussion of possible laws to regulate the sale respectively of narcotics and of proprietary compounds containing alcohol. Of the American Pharmaceutical Association. Of the National Wholesale Druggists' Association. Of the Proprietary Association of America. To Provide Against the Evils Resulting From the Traffic in Certain Narcotic Drugs, and to Regulate the Sale Thereof. Be It Enacted by the General Assembly of the State of • . Section I. That it shall be unlawful for any person, firm or corporation to sell, furnish or give away any cocaine, alpha or beta eucainc, opium, morphine, heroin, chloral hydrate or any salt or compound of any or the foregoing substances, or any preparation or compound containing any of the foregoing substances, or their salts or compounds, except upon the original written order or prescription of a lawfully authorized practitioner of medicine, dentistry or veterinary medicine, which order or prescription shall be dated and shall contain the name of the person for whom prescribed, or if ordered by a practitioner of veterinary medicine shall state the kind of animal for which ordered, and shall he signed by the person giving the prescription or order. Such written order of prescription shall be permanently retained en file by the person, firm or corporation who shall compound or dispense the articles ordered or prescribed, and it shall not be again compounded or dispensed, except upon the written order of the original prcscriber for each and every subsequent compounding or dispensing. No copy or duplicate of such written order or prescription shall be made or delivered to any person, but the original shall at all times be open to inspection by the prescribcr and properly authorized officers of the law. Provided, however, that the above provisions shall not Apply to preparations containing not more than two grains of opium or not more than one-fourth grain of morphine, or not more than one fourth a grain of heroin, or not more than one-eighth grain of cocaine, or not more than one-eighth grain of alpha or beta eucaine, or not more than ten grains of chloral hydrate, in one fluid-ounce, or if a solid preparation, in one avoirdupois ounce. Provided also that the above provisions shall not apply to preparations containing opium and recommended and sold in good faith for diarrhea and cholera, each bottle or package of which is accompanied by specitic directions for use, and a caution against habitual use, nor to powder of ipecac and opium commonly known as Dover's Powder, nor to liniments or ointments when plainly labeled "for external use only.'' And provided further that the above provision shall not apply to sales at wholesale by jobbers, wholesalers and manufacturers to retail druggists or qualified physicians, or to each other, nor to sales at retail by retail druggists to regular practitioners of medicine, dentistry or veterinary medicine, nor to sales made to manufacturers of proprietary or pharmaceutical preparations for use in the manufacture of such preparations, nor to sales to hospitals, colleges, scientific or public institutions. Sec. 2. It shall be unlawful for any practitioner of medicine. dentistry or veterinary medicine to furnish to or to prescribe for the use of any habitual user of the same any cocaine, heroin, alpha or beta eucaine, opium, morphine, chloral hydrate, or any salt or compound of any of the foregoing substances, or any preparation containing any of the foregoing substances or their salts or compounds. And it shall also be unlawful for any practitioner of dentistry to prescribe any of the foregoing substances for any person not under his treatment in the regular practice of his profession, or for any practitioner of veterinary medicine to prescribe any of the foregoing substances for the use of any human being. when such prescriptions are not given or substances furnished for the purpose of evading the provisions of this act. Sec. 3. 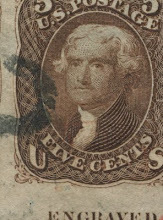 Any person who shall violate any of the provisions of this act shall be deemed guilty of a misdemeanor, and upon conviction for the first offense shall be fined not less than $25.00 nor more than $50.00, and upon conviction for a second offense shall be fined not less than $50.00 nor more than $100.00, and upon conviction for a subsequent offense shall be fined not less than $100.00 nor more than $200.00, and shall be imprisoned in the county jail for not more than six months and if a licensed pharmacist, physician, dentist or veterinary surgeon, his license shall be revoked. It shall be the duty under this act of ail judges of the courts of common pleas in this State, at every regular term thereof, to charge all regularly impaneled grand juries to diligently inquire into and investigate all cases of the violation of the provisions of this act and to make a true presentment of all persons guilty of such violations. It shall be the duty of the Board of Pharmacy to cause the prosecution of all persons violating the provisions of this act. No prosecution shall Ix. * brought for the sale of any patent or proprietary medicine containing any of the drugs or preparations hereinbefore mentioned until the Hoard of Pharmacy shall certify that such medicine contains any of the said drugs or preparations in excess of the maximum percentages hereinbefore mentioned. Sec. 4. In any proceedings under the provisions of this act the charge may be brought against any or all of the members of a partnership, or against the directors or executive officers of a. corporation, or against the agent of any person, partnership or corporation. Sec. 5. All laws and parts of laws in conflict with this act are hereby repealed. To Regulate the Sale of Certain Proprietary Medicines. Section 1. Any proprietary medicine which contains a percentage of alcohol greater than is reasonably necessary for the extraction and dissolving of the active constituents of the druies used in the preparation of said medicine or to prevent the precipitation of such active constituents, or to preserve the medicine from fermentation or freezing, shall be deemed to be an intoxicating liquor and shall be sold only under the provisions of the law regulating the sale of intoxicating liquors. Provided that this act shall not be construed to apply to preparations compounded according to any formula embraced in the United Slates Pharmacopeia or the National I'ormulary, when sold under a title recognized by the said t'nited States Pharmacopeia, or National Formulary. Sec. 2. No prosecution shall be brought for the sale of any proprietary preparation in violation of the provisions of this act unless the Hoard of Pharmacy shall, after due investigation, certify that such proprietary preparation contains alcohol in a percentage greater than the limit fixed by Section 1. Thirty years ago cod liver oil had to be forced down the patient's throat. Invalids could not take it and the children would not. But the doctors prescribed it and it had to be taken. Yet it cured people, for it has ever been the greatest of all tissue-builders and general reconstructives. About 1874 came the change. Tt was then Scott's Emulsion first appeared. The days of dreading the dose ceased. Cod liver oil taking became easy. The palate was pleased, the stomach was satisfied, the patient prospered and the doctor was delighted. Druggists everywhere commenced to order the old remedy in its new dress. And from those early days began the enormous' demand of today for cod liver oil. Scott & Bowne are responsible to a great extent for the present extensive use of cod liver oil either plain or as an emulsion. They first made it palatable, fir^t made it popular, first extensively told of its therapeutic value, first brought out a pleasant, permanent emulsion of the oil with hypophosphites. Thirty years have passed and, notwithstanding the countless thousands of imitations, Scott's Emulsion is known to be the standard preparation and most staple and reliable emulsion on the market. Ignored pharmacokineticspushed for law allowing him to do so while forever forbidding his office from looking at that agricultural commodity of tobacco. Next to cocain nostrums, the most dangerous class of patent medicines is that containing narcotics, such as opium, morphin and cannabis indica. Various are the evasions and contortions resorted to by these dopes in their efforts to make the best of the new law. 1910 U.S.D.A. Farmer's Journal article "Habit-Forming Agents: Their Indiscriminate Sale and Use A Menace to the Public Welfare"
During the last twenty years a large number of soft drinks containing caffein and smaller or greater quantities of coca leaf and kola nut products have been placed upon the market. Preparations of this class, on account of insufficient information, were formally looked upon as harmless, but they are now known to be an impending evil. 1905 was the year of Tobacco’s deletion from the U.S. Pharmacopoeia, and hence its shielding by the impending 1906 US Food & Drug Act, from its definitions of regulatable substances, and of the A.M.A. founding its "Council on Pharmacy and Chemistry" consisting of 15 men. (in 1906-07). These included U.S.D.A. Bureau of Chemistry Chief, Harvey Washington Wiley; U.S.D.A. Drug Division Lyman.F. Kleber, A.M.A. General Secretary; and Journal of the American Medical Association J.A.M.A. editor Gene Simmons. This 1905 AMA-APhA report on Vin Marinai saying nothing about health matters, instead condemning Vin Mariani sold in North America as a fraudulent foreign product when such was in fact blended in Mariani's New York (W 15th Street, Manhattan) factory from the identical ingredients used in France where it was initially formulated. Each ounce contains 0.71 grains 0f cocaln. A chewing paste of leaves of the coca plant, combined with other valuable tonics. Although a powerful muscular or nervous tonic, coca-bola has no evil after-effects, and hence is far superior tu any other stimulant in the materia medica. A small portion chewed occasionally acts as a powerful Ionic to the muscular and nervous system, enabling the chewer to perform additional labor, and also relieves fatigue and exhaustion without evil after-effects. It contains no injurious Ingredients and is perfectly harmless. So we might quote fr.om the circular which is sent out by a man who claims to be a physician, urging, as it were, on the people the use of a product of this kind, which, as has clearly been shown, must in the end result in the formation of the cocain habit, if not in the complete demoralization and degradation of the individual himself. What little we sell now conforms strictly with the requirements of the United States Pure Food and Drug Law, and is sold only on special order of physicians and their prescriptions. September 13, 1909. E. F. Ladd, South Dakota Agricultural College, Agricultural College, S.D. Your favor of September 7th duly received for which please accept my thanks. Owing to the "crank" legislation of many states we have discontinued the manufacture of all coca and cocain preparations. Any "fool" druggist of your state who gets or fells an old package of our coca-bola does it at his own risk, as necessarily, having been put out some time ago, there is no guarantee, and we will not protect him. The people are getting a little sense into their beads, however, gradually, and they will sometime realize that preparations of both coca and cocain have an honest and legitimate use by the medical profession. Your state law is silly, and on a par with the 9-foot bed sheet laws of Texas and Oklahoma Of course, your duty is to enforce the law, not to criticise it. I can do that. I am. Yours very truly. Diet, by C. L. M. Charles L. Mitchell, M.D. A letter of this kind needs no comment, and a product of this kind, in the judgment of the writer, can only be sent out for malicious purposes and its sale is illegal in North Dakota. We warn the public against* either handling the same or using the same, if they would avoid the formation of a serious drug habit and one that must result in positive injury to our people. This product, put up in the form of a gum, would easily take the place—for one who had formed the habit for cocain— of tobacco; and it might be made to take the place of chewing gum with young people who would be entirely innocent of the intentional use of any such preparation, not knowing the evil effects that would come from its continued use. In the judgment of the writer, no man who will allow his name to be connected with a scheme of this kind should bo permitted to digrace the profession of medicine by using the title M.D. (from The Journal of the American Medical Association (JAMA) January 9, 1910. That's a most ironic statement, given that Coca or even isolated cocaine (in properly buffered dilute form) would be an infinitely safer healthier substitute for Tobacco consumption. I wrote this with the idea of presenting the various therapeutic uses of Coca that could reduce health care costs, highlighting Anita Bennett’s idea of giving Coca tea to women in labor to ease childbirth and thus reduce the occurrence of protracted births that cause brain damage for newly borns. This panel was to feature (and had the support of) Harvard University’s Dr. Lester Grinspoon, yet was rejected by the D.P.F., with a letter taking issue with my inviting speakers, informing me that the D.P.F. had the authority to directly contact speakers. Douglas A. Willinger, moderator Submitted to the Drug Policy Foundation. "Cocaine" -- or more accurately, Coca just had many uses. The Extra Pharmacopoeia (the British counterpart to the U.S. Pharmacopoeia) cited Coca as a "nervine and muscular tonic, preventing waste of tissue, appeasing hunger and thirst, relieving fatigue, and aiding free respiration ... useful in various diseases of the digestive and respiratory organs.... " Meanwhile, the Wine of Coca, , became the most widely praised plant preparation of the time. ’s creator, Angelo Mariani was hailed by Pope Leo XIII as a "benefactor of humanity" for making Coca available around the world- after 40 years of Coca wine distribution." CHEMISTS TO MEET IN ROME. Washington, D. C, December 30.—TheSixth International Congress of Applied. Chemistry, which meets every three years, will convene in Rome Easter Monday, 1906. The congress meets there at the invitation of and under tbe patronage of the Italian (government, and the King of Italy will be present to open the session. A cordial invitation to attend the meeting has been received from King Victor Emmanuel, which has followed the regular course, passing through the Italianembassy and tbe State Department to Dr. H. W. Wiley, Chief of the Bureau or Chemistry, who is chairman of the American committee of the section. "The meeting of the Sixth International Congress of Applied Chemistry is a matter in which American chemists are interested, for, as a matter of fact, there will be not less than 100 of the lending chemists of this country in attendance." This puts Harvey Wiley in Rome right at the time of the death of the leader of the Roman Catholic religous order that runs Washington, D.C.'s oldest university with the greatest participation in the U.S. government. In 1905, a tumor forced the amputation of his right arm. Pope Pius X granted him permission to celebrate mass despite his disability, a privilege for which he was most grateful. The cancer, however, soon invaded his lungs and he died in Rome, on 18 April 1906. Dr. Harvey W. Wiley, known nationally as "the pure food man," was born in Kent, Indiana, October 18, 1844. His mother, Lucinda Weir Maxwell, was a granddaughter of Bezaleel Maxwell. She married Preston P. Wiley on March 1, 1832. Of this union seven children were born, of which one, Samuel Maxwell, died in infancy. The subject of our sketch received his early collegiate training at Hanover College, from which institution he graduated with the A. B. degree in 1867, receiving the degree of A. M. there in 1870. He studied medicine with Dr. S. E. Hampton, of Milton, Kentucky, and entered the Medical College of Indiana at the beginning of the term, 1869, graduating there in 1872. In 1873 he graduated from Harvard and was appointed professor of Medical Chemistry in the college. He discharged the duties of this office until the fall of 1878. 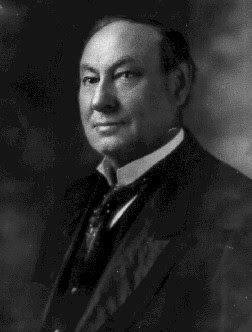 From the time of organization until February, 1915, a period of nine years, he served on the Council of Pharmacy and Chemistry of the American Medical Association. Doctor Wiley is a member of the Medical Society of the District of Columbia, of the American Medical Association, of the American Public Health Association, of the American Pharmaceutical Association, and of the American Therapeutic Society, of which he was president in 1910-11. He says his services to medicine have been honored more in the breach than in the observance, as he has never practiced. Besides the collegiate degrees already mentioned, he received the B. S. degree from Harvard in 1873. The following honorary degrees have been conferred upon him: Ph. D., Hanover, 1876; LL. D., Hanover, 1898; LL. D., University of Vermont, October 12, 1911; D. Sc., Lafayette College, Easton, Pennsylvania, June 19, 1912. His activities as a medical scientist and chemist have been based upon a long experience as a teacher. From 1867-1870 he was professor of Latin and Greek at Butler College. In 1871 he taught science in the Indianapolis High School. In 1874 he was professor of Chemistry at Butler. And from 1874-1882 he was professor of Chemistry at Purdue and State Chemist of Indiana. He taught in George Washington University, 1899-1914, as Professor of Agricultural Chemistry, and held the position of Consulting Professor of Food Chemistry in the Polytechnic Institute of Brooklyn in 1905. From 1884 to 1912 Doctor Wiley was secretary of the Association of Official Agricultural Chemists. 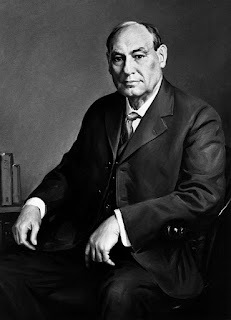 It was as Chief Chemist of the United States Department of Agriculture (1883-1912), and while Chairman of the Board of Food and Drug Inspection (1907-1912), that he gained a name and national prominence in his relentless stand against food adulteration. Through experimentation and other methods he convinced the public mind that many foods were being treated with drugs, such as sodium benzoate, that were harmful as preservatives. The manufacturing interests financially involved went after Doctor Wiley, and a fight, very interesting to the general newspaper reading public, resulted. But right is right if might is might, and right and Doctor Wiley won, because the contest was to uphold a principle that was for the public weal—pure food. He was heartily supported by the women's clubs, the medical profession and the public at large. Doctor Wiley has thrice been a member of Juries of Awards at the world's expositions—in 1893 at the Chicago World's Fair; at the Paris Exposition in 1900; and at the Jamestown Exposition in 1907. He has served as United States delegate to the Third International Congress of Applied Chemistry at Vienna, in 1898; to the Fourth Congress in Paris, 1900; to the Fifth Congress in Berlin, 1903; to the Sixth Congress in Rome, 1906; and to the Seventh Congress in London, 1909, when he acted as Chairman of the American Committee. 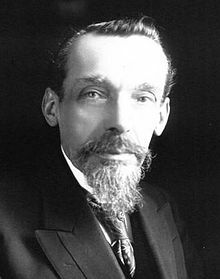 In 1908 he was Honorary President, Premier Congres International pour la Repression des Fraudes Alimentaries et Pharmaceutiques, Geneva; and in 1909, Corresponding Member for the United States, Societe Universelle de la Crois-Blanche de Geneva. He has three times received decorations: Chevalier Merit Agricole, 1900; Chevalier, Legion d'Honneur, 1909; Elliott Cresson Medal of Franklin Institute, 1910. A member of twenty-two scientific societies and an honorary member of fourteen institutes and societies, one would hardly expect Doctor Wiley to be much of a club man. Yet he belongs to no less than six: The Chemists' Club of New York, the Chevy Chase Club of Washington, D. C, the Franklin Inn Club of Philadelphia, the Harvard Union of Cambridge, the National Press Club of Washington, D. C, and the Cosmos Club of Washington, of which latter he was president in 1910-12. Along with many other activities, Doctor Wiley has found time to write books and articles for the magazines. He is contributing editor to Good Housekeeping Magazine. A book on Foods and'Their Adulteration, published by P. Blakiston's Son and Company, Philadelphia, comes from his pen. He has also produced a standard work, in three volumes, on the Principles and Practice of Agricultural Analysis (The Chemical Publishing Company of Easton, Pennsylvania). The Lure of the Land is published by the Century Company of New York. Though Doctor Wiley retired from public life in 1912, he has not lost interest in public affairs. He is now president of the United States Pharmacopoeial Convention, 1910-15, which is preparing the ninth decennial volume of the United States Pharmacopoeia. He is president of the Citizens' Committee of One Hundred, charged with the safeguarding of the interests of the citizens of Washington against unfair fiscal legislation. He is president of the Mouth Hygiene Association of the United States, looking after the care of the teeth of the nation. He is president of the Columbia Hospital for Women, which is a National Hospital created by the Congress and conducted by a board of trustees consisting of Senators, Representatives and citizens. For the past three years he has been connected with the Redpath Chautauqua and Lyceum Service and has given over three hundred lectures in all parts of the United States. He is a director of one of the largest banks in Washington and personally looks after extensive business interests. He is also a trustee of Hanover College, to which he has made large financial contributions. On February 27, 1911, Doctor Wiley was united in marriage to Miss Anna C. Kelton, daughter of Major-General John C. Kelton, U. S. A., and Josephine Campbell Kelton. Two children have been born to them: Harvey W. Wiley, Jr., born May 16, 1912, and John Preston Wiley, born February 27, 1914. Since 1912 Doctor Wiley has spent a large part of his time lecturing, writing, and enjoying himself as a farmer. He owns a plantation in Loudoun County, Virginia, not far from the site of the old home of his great grandfather, Bezaleel Maxwell. Labels: AMA, APhA, Harvey Washington Wiley, U.S.D.A.